Panamá y la República Popular China establecen relaciones diplomáticas. 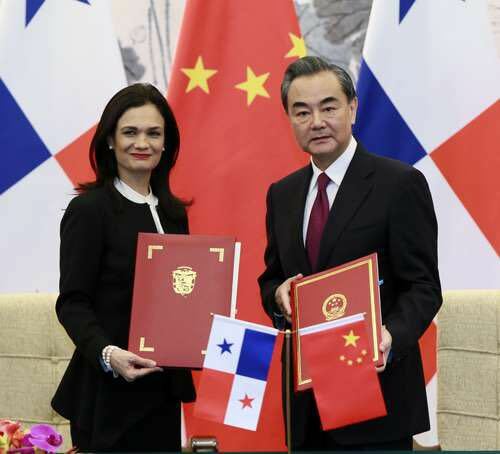 In the light of the interests and wishes of both peoples, the Republic of Panama and the People’s Republic of China decided to grant each other mutual recognition and establish diplomatic relations at the level of ambassadors from the date of signature of the communiqué. The two Governments agree to develop friendly ties between the two countries on the basis of the principles of mutual respect for sovereignty and territorial integrity, non-aggression, non-intervention in the internal affairs of the other, equality and reciprocal benefit and peaceful coexistence. The Government of the Republic of Panama recognizes that there is only one China in the world, the Government of the People’s Republic of China is the only legitimate Government representing all China and Taiwan is an inalienable part of the Chinese territory. The Government of the Republic of Panama today breaks its “diplomatic relations” with Taiwan, and undertakes to leave any official contact or relationship with Taiwan. The Government of the People’s Republic of China expresses its appreciation of the above-mentioned position of the Government of the Republic of Panama. The Government of the Republic of Panama and the Government of the People’s Republic of China, in accordance with the provisions of the Vienna Convention on Diplomatic Relations of 1961 and international practice, agree to the early and mutual sending of Ambassadors and to provide a basis for reciprocity , All the necessary assistance for the installation in their respective capitals of the Embassy of the other Party as well as to facilitate the performance of their functions. With the authorization of their respective Governments, the representatives of the two Parties for the subscription sign the notice in the city of Beijing, on the thirteenth (13th) day of June 2017, in two copies in the Chinese and Spanish languages. Both texts being equally authentic.